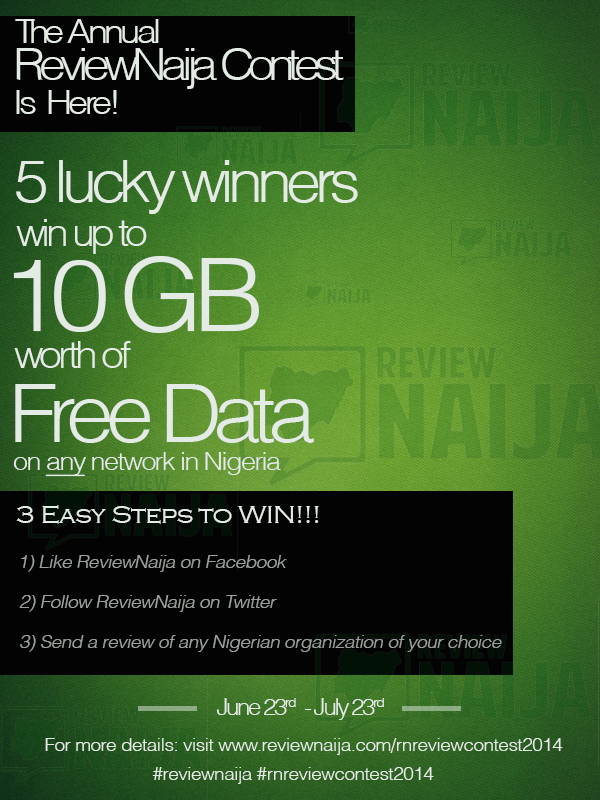 So you’ve liked RN on fb, followed us on twitter and want to win free data of up to 10GB? Here are the rules! UPDATE ON 06/30: For your review to qualify, you must send in a review of an organization that hasn’t already been reviewed on RN. You can use the search functionality on our site (or google) to check if an organization has already been reviewed. Otherwise, we’re also happy to check for you if you send us an email. Categories: We currently accept reviews of organizations from all categories listed here. Reviews will be judged based on the content, authenticity, originality, writing style and picture quality. Our in house staff will assist in selecting the top 10 reviews; however you all get to vote for the winner! 1st – 10GB free data on ANY Nigerian network! 2nd – 8GB free data on ANY Nigerian network! 3rd – 6GB free data on ANY Nigerian network! 4th – 4GB free data on ANY Nigerian network! 5th – 2GB free data on ANY Nigerian network! **Note: Data plans vary by network. In the event a winners network does not offer one of the options listed above (e.g. a 6gb data plan), we’d try to ensure you get the best offer possible. Pornographic content or content that insights, insinuates, instigates or illustrates (whether implicit or explicit) ideas of a sexual nature. Click here to start submitting reviews right away!